Look Out For Pergola Design Ideas All Around. While on vacation this summer, my family I noticed pergolas seemingly everywhere we went. Now, of course this is because that is what we do – we are always on the lookout for new and exciting pergola designs to share with our customers! You might notice that once you have considered ways to upgrade your yard that you start to really see every landscaped space you encounter. For instance, we saw some excellent samples of vinyl pergolas at our hotel. Just before we left someone contacted us about helping them install a vinyl pergola kit so these types were particularly on our minds. The resort where we stayed had ten different pools and hot tubs spread out around the property and many of them overlooked the ocean. Every poolside area featured a shade structure with lounge chairs beneath it. Some of them were long and curved to match the line of the pool. They all looked so clean and sharp thanks to the fact that they are super resistant to moisture damage and just need to be hosed off now and then to keep them clean. I am sure that is why the hotel owner’s chose that type! Much less long term maintenance. Once I saw my client’s property and that they wanted the vinyl pergola kit to be built over their hot tub which was just off the pool I could see why they chose to do that rather than build a wooden one on their own. It was going to cost a little more up front to buy and build the kit, but with the long term benefits, it was well worth it. When looking for information to help make a decision about pergola designs and material selection, it is most common to see and learn about different wood products. Wood is readily available in local home improvement centers and lumberyards making it the most inexpensive option initially. Whether you are looking for parts to build your own pergola from a set of plans, or even checking out pergola kits, from the start you can see that wood will not break your budget. However, you probably also find many examples of vinyl pergolas, particularly when you are looking at kits. So why should you consider vinyl? The huge advantage to vinyl is in how well and long it lasts with literally no ongoing maintenance. If you have any sort of wood product in your yard – a fence, a gate, or patio furniture for instance – you have already learned that you cannot just leave it alone and expect to look beautiful without assistance. Even when properly pressure treated and stained, over the years the rain, snow, rain and hail will wear it down. Insects can attack it threatening the structural integrity of the structure. You need to restrain and treat the wood every few years in order to prevent any of that damage. Wood is certainly desirable for the look it provides, but there is a reason it is cheaper and you do need to be prepared for ongoing care. Vinyl simply needs to be hosed off now and then to keep it clean. That’s it! So you might pay more up front, but then your done. No more effort or cost. Vinyl is a synthetic material that is impervious to weather and insect damage. It is also not always a solid piece. Typically the vinyl is covering either a composite wood or, as in the examples shown above, an aluminum core. And yes, you can buy parts to build your own. Look for plastic suppliers vs lumberyards. Vinyl fencing and decks are very common and it is quite easy to purchase individual pergola parts from those types of vendors. Aluminum core materials are more expensive than wood composite core but both are available. 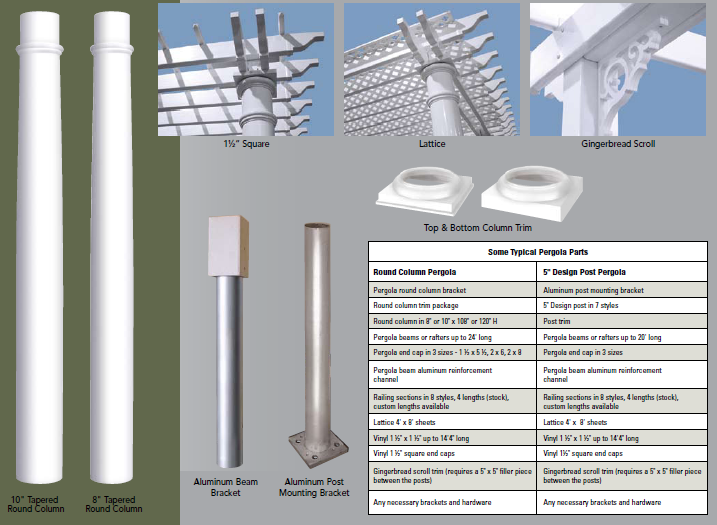 The best possible solution that we have found is this Liberty Vinyl Pergola Kit. The list price starts are just under $1,100 and that is really quite a good price for a pergola kit and complete building instructions. You will just need one day and two people and incredibly basic tools to put it together. No cutting or measuring required.